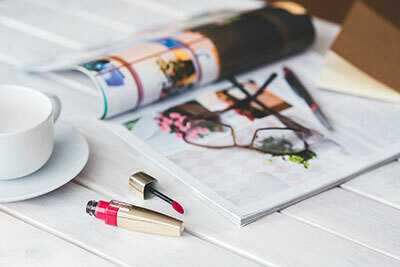 This is part one of the Must-Have series I’m starting on the blog! 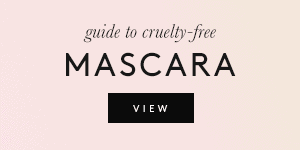 I’ll be going over everyday beauty staples that we all need, and giving you cruelty-free alternatives. 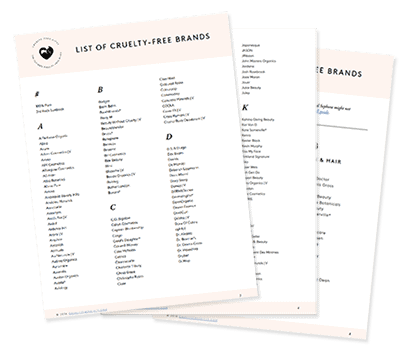 If you’re already using cruelty-free products exclusively, you might get some new ideas. But if you’re just starting out on your switch, this series will make it much easier (or so I hope!). In this post, I’ll be going over facial moisturizers. 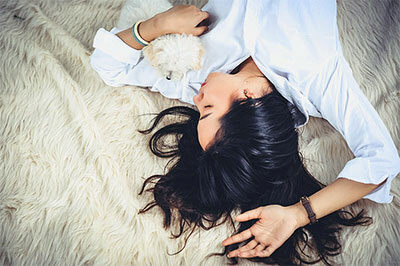 To navigate it, consider your skin type first. 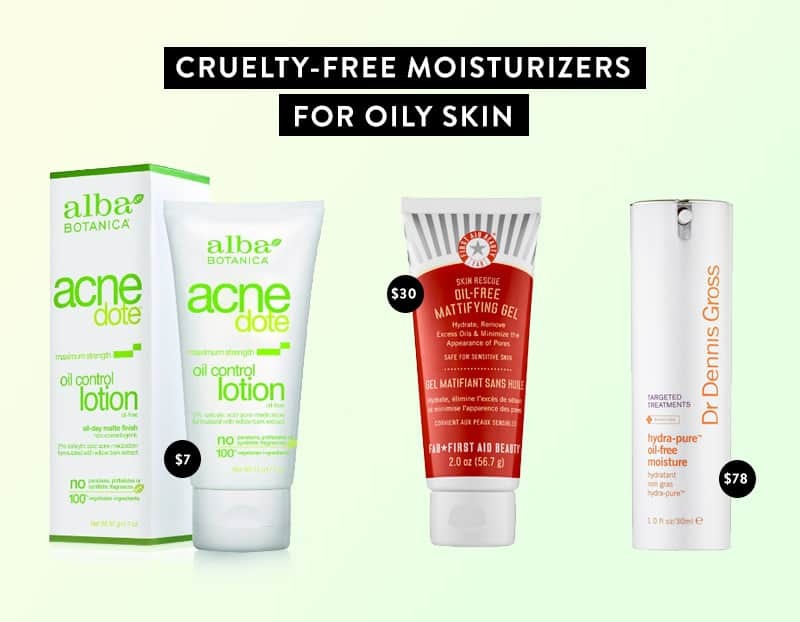 Do you have dry, oily, sensitive, or combination skin? Scroll down to your skin type and you’ll see a budget option, a mid-range option, and a high-end option. You can also see where the products are available. 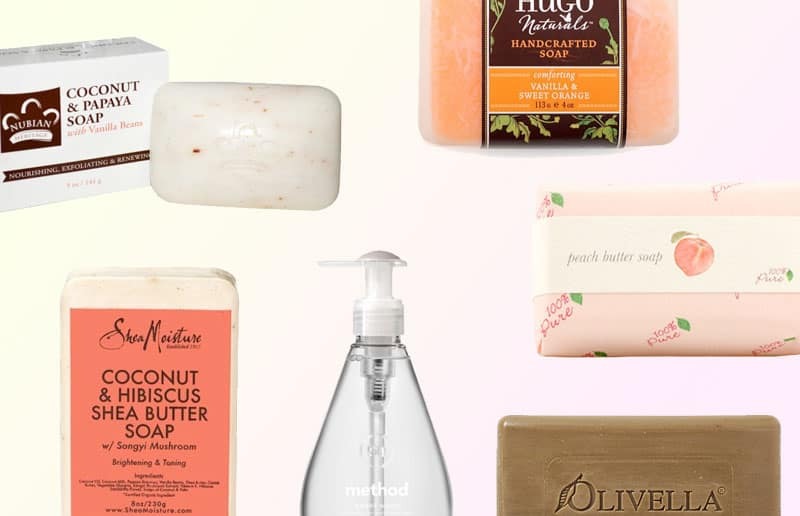 These picks are for those with oily skin or blemish-prone skin. 1. Alba Botanica Acnedote Oil Control Lotion. This is a great moisturizer if you’re on a budget. It has a light consistency and a matte finish, plus it contains 2% salicylic acid to target blemishes and get rid of them quickly. 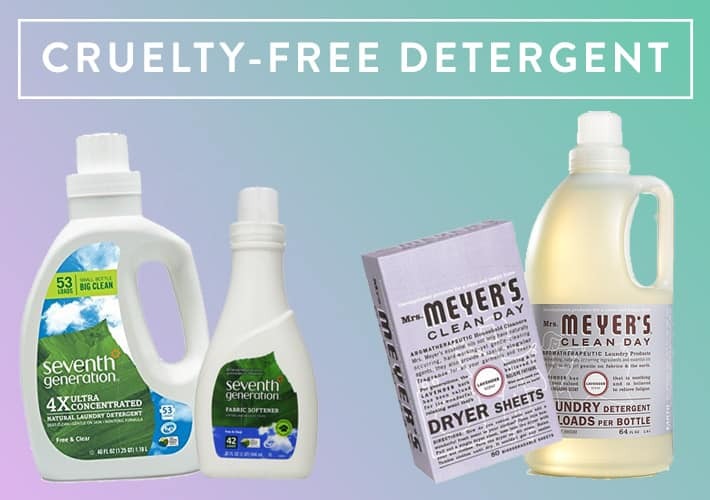 It’s the best drugstore alternative to products from brands like Clean & Clear, which aren’t cruelty-free. Where to buy: Amazon (best price) – iHerb ($12.29). 2. First Aid Beauty Skin Rescue. The mid-range pick is First Aid Beauty’s Skin Rescue Mattifying Gel Moisturizer. This brand is perfect for sensitive skin, so if you have both sensitive and oily skin, this one’s for you. It’s oil-free, won’t cause breakouts, and contains ingredients that decrease sebum production. Where to buy: Sephora ($30). 3. Dr. Dennis Gross Hydra-Pure. If you’re looking for something high-end to fight blemishes, the Hydra-Pure Oil-Free Moisture with Chelating Complex has very good reviews on Sephora. It’s fast-absorbing and targets oily skin and acne, but it also has antioxidants and antiaging properties (such as CoQ10). 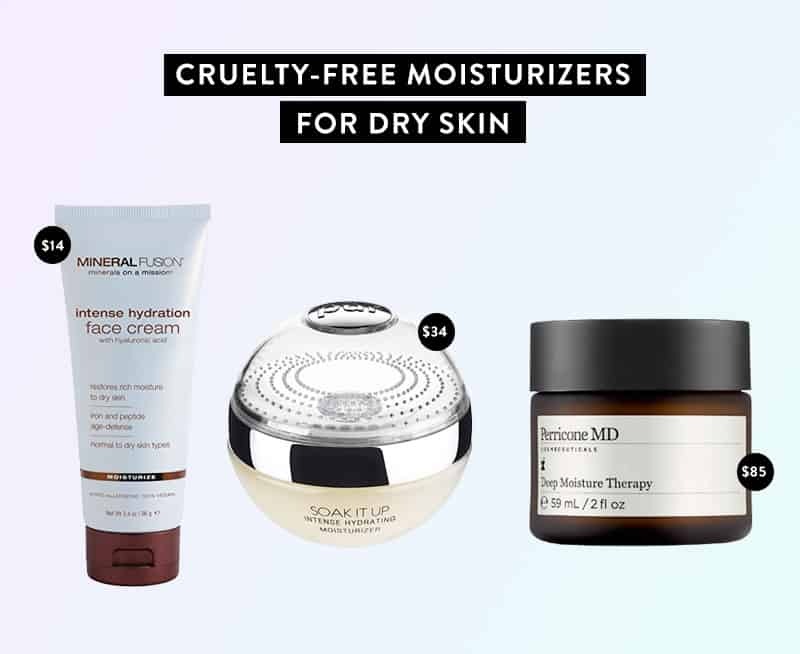 These options will work best for those with dry and very dry skin. If you have problems with dry patches or cracking skin, here are some solutions. 1. Mineral Fusion Intense Hydration. This is a great drugstore option for those who need plenty of moisture. It’s affordable yet contains nourishing ingredients like Shea Butter, Rosehip Oil, and even Hyaluronic Acid for intense hydration and soft skin. Where to buy: Amazon (best price) – iHerb ($18.40). 2. PUR Soak It Up Intense Hydrating Moisturizer. This is an intense moisturizer that has great reviews from those with dry skin. It absorbs quickly and it’s non-greasy, but it provides a lot of hydration and it contains Hyaluronic Acid for soft, supple skin. Also, who doesn’t want a moisturizer in a pokeball?! Where to buy: Ulta ($34). 3. Perricone MD Deep Moisture Therapy. 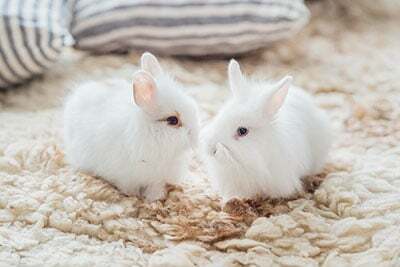 Edit: Perricone MD is no longer cruelty-free as they started selling in China. For a luxury treatment for dry and very dry skin, Perricone MD makes a great moisturizer they describe as an “antioxidant powerhouse” in a jar. It’s really moisturizing without being greasy, and a little goes a long way. Where to buy: Sephora ($85) – Ulta ($85). 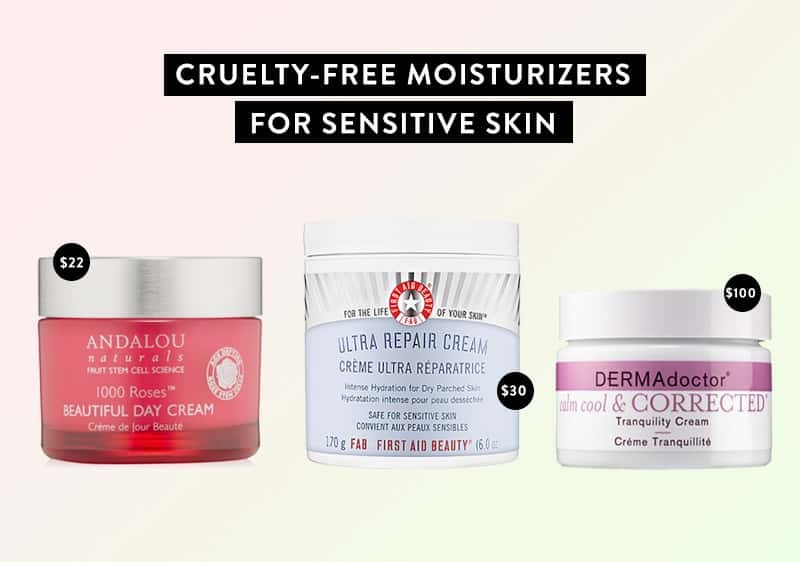 The following picks are good options for those with sensitive skin that’s easily irritation, prone to redness, or to other skin conditions. 1. Andalou Naturals 1000 Roses. This Beautiful Day Cream is great for those with sensitive skin, and it has no artificial fragrance or harsh chemicals. It’s meant for “delicate” skin on the dry side, but it’s great for those with normal or combination skin as well. Andalou Naturals is certified organic and fait trade. Where to buy: Amazon (best price) – iHerb ($21.24). 2. First Aid Beauty Ultra Repair. This product is a holy grail for many ladies with dry and sensitive skin. 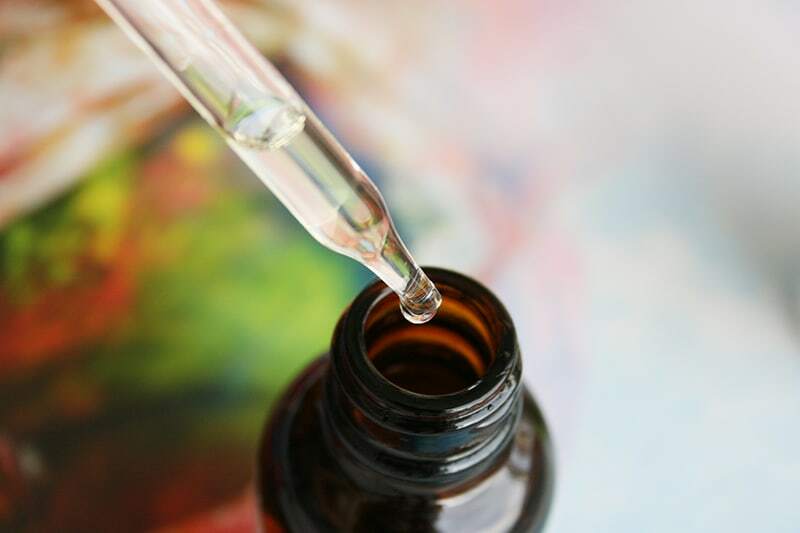 It’s meant for those with skin conditions such as dermatitis, eczema, or keratosis pilaris, but it has rave reviews from those with sensitive and irritated skin as well. Where to buy: Sephora ($30) – Ulta ($30). 3. Dermadoctor Calm Cool & Corrected. If you’re looking for a serious treatment for sensitive skin and you’re not on a budget, this lotion from Dermadoctor targets redness and sensitive specifically. It’s worth sampling it from Sephora to see if it works with your skin. Where to buy: Sephora ($100). 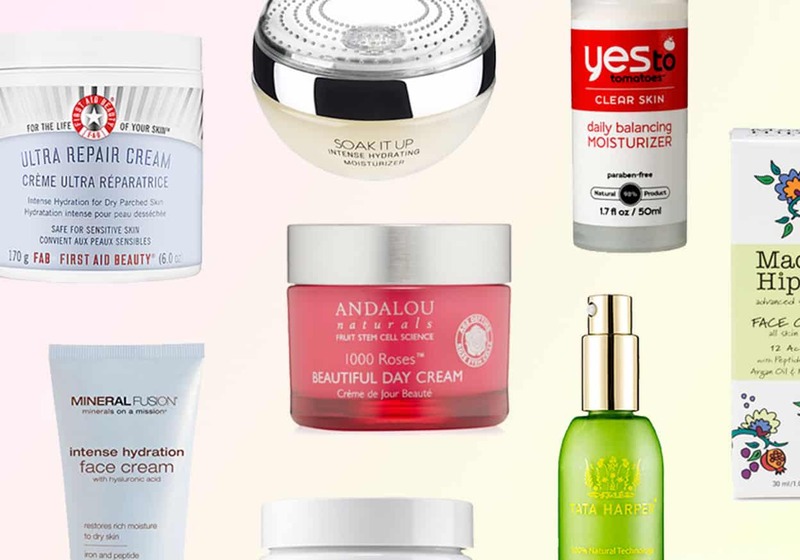 If you have combination skin, these moisturizers aims to balance everything out. They’re also great choices for normal or in-between skin. 1. Yes To Balancing Daily Moisturizer. If you have combination skin and you’re looking for a drugstore option, look into Yes To Tomatoes. This particular moisturizer balances dry and oily areas and makes your skin smooth and soft. Where to buy: Amazon (best price) – Ulta ($10.49). 2. Mad Hippie Face Cream. Mad Hippie’s moisturizer hits a sweet spot. It provides just enough moisture for normal to combination skin types, not to mention it’s packed with antioxidants and active ingredients. A great daily moisturizer that feels just right. Where to buy: Amazon – iHerb ($20.79). 3. Tata Harper Rebuilding Moisturizer. If you’re looking for a luxurious moisturizer, this one by Tata Harper is also non-toxic and all-natural and it restores balance to combination skin. It’s moisturizing but provides a matte finish, and it won’t close pores and cause breakouts. Where to buy: Sephora ($105). If you’re looking for a moisturizer with SPF, go check out my post about facial sunscreens here. If you have any holy grail moisturizers I haven’t mentioned, leave them in the comments along with your skin type! i’m obsessed with the entire andalou 1000 roses line. I use Lush’s Imperialis and Celestial for my dry skin and love it! I’m SO excited for this series, especially after this post! Great idea Suzi and thank you for all of the options above! 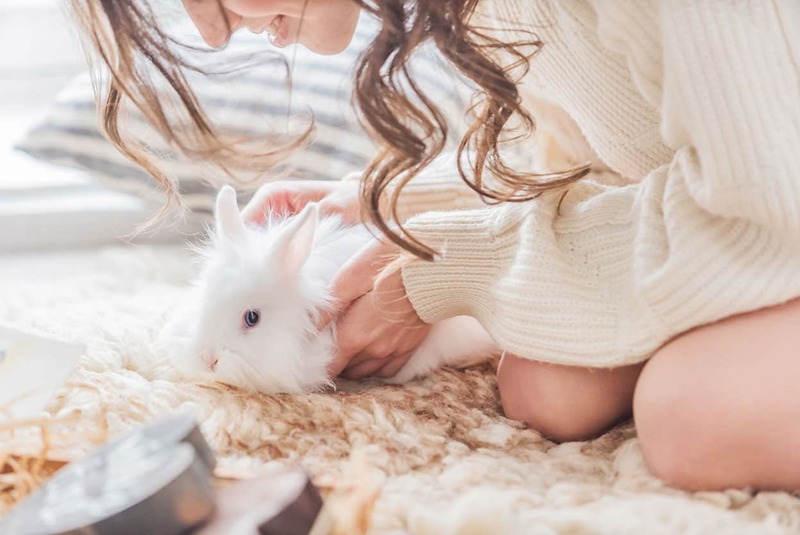 Hi, I’ve posted this question before but I received no reply 🙁 do you know if Arcona tests on animals? It’s sold in Sephora. I love the CeraVe AM moisturizer with SPF 30 but I cannot find definitive info on CeraVe as to whether it is CF or not. If they’re not on the PETA or Leaping Bunny list, then that says a lot about the company already and I would opt for another one. Cerave doesn’t test on animals but there is a cholesterol ingredient in it that is derived from animals. 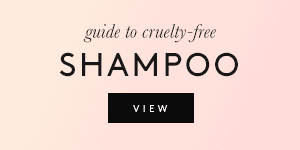 So not tested on animals, but not vegan. I am now getting into Tatcha. Love it. Also try Paula’s Choice. What about for (dry, oily, comb)mature, aging skin, to fight wrinkles and loss of firmness? Trader Joe’s has two I really like (“Nourish”). 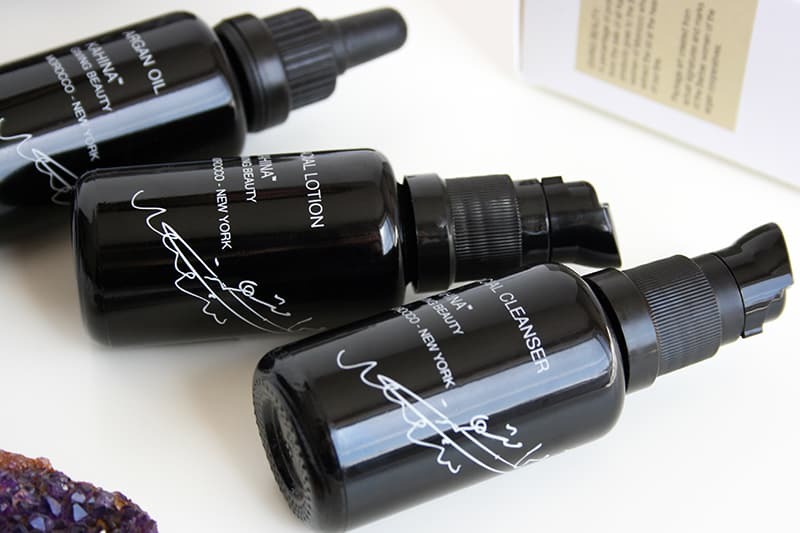 The oil free version is great for summer, and the intense one is better for winter. 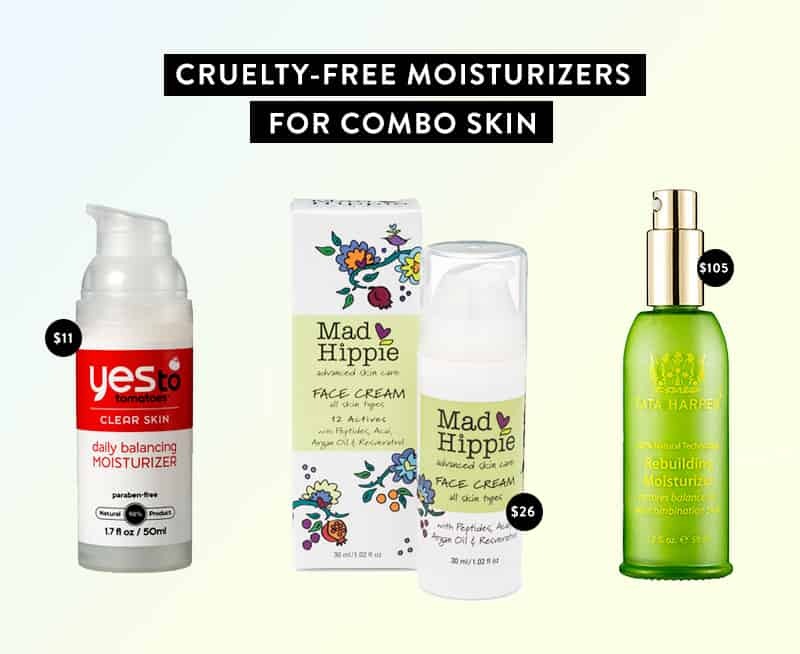 I have sensitive combination skin, and they are cruelty free, fragrance free, and a great value! Please update this list. 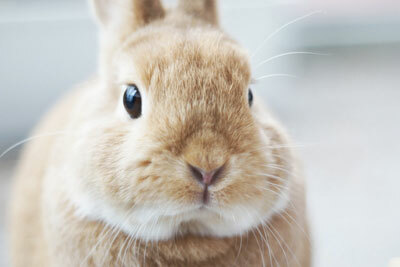 Perricone MD now sells their products in China where animal testing is required. 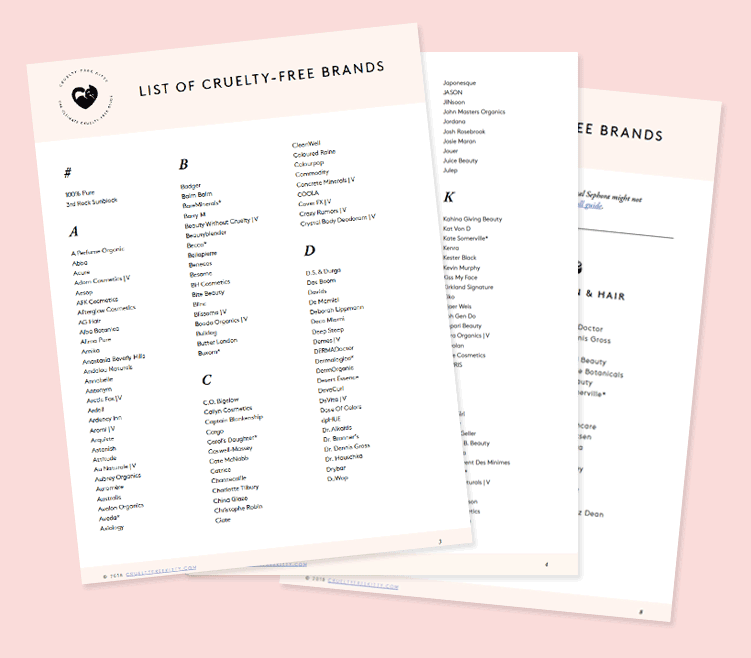 I’ve been using Palmer’s Cocoa Butter Formula all of my life and from what I’ve seen on their site it’s totally cruelty free! It’s a thick and luscious formula that I can swear by! The Ordinary makes an amazing moisturizer, it is super cheap too. I have extremely dry flakey skin and it does wonders! It doesn’t have a fancy smell but it does work! I swear by it. Thanks so much for this – but I’m really concerned about the use of hydrogenated palm glycerides in some of these and their effect on the environment. Would you ever consider doing a piece on whether these are harmful and how to avoid? Does Andalou’s 1000 Roses really have roses in it? Rose is supposed to be good for sensitive skin, but I’m extremely allergic to roses. I like Juice Beauty’s Green Apple Age defying moisturizer. Great for dry skin or as a night time moisturizer.